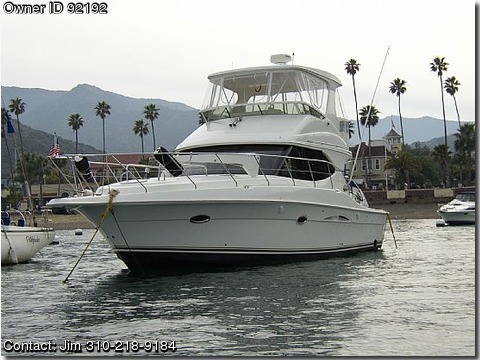 Call Boat Owner Jim 310-218-9184. Basic Decription: The 2004 Silverton vessel “All In” is a 38C twin diesel Convertible Sport Fisher Hardtop with fly-bridge enclosure. Purchase includes Slip A-59 in Port Royal Marina in Redondo Beach, CA. This boat comes fish ready with all the gear, tackle center, outriggers, and built-in bait tank, and is viewable from Seaside Lagoon – no appointment necessary. Beds comfortably sleep 8 adults, with 2 staterooms and a beautiful Ultra-Leather main salon. Fully-equipped galley, wet bar, ice maker, and entertainment center with halogen lighting and custom appointments throughout. Equipment • Cummins 370D diesels with 375 gals fuel • Kohler 12KW generator with separate charger and battery • Glendenning synchronizer • Oil changer • Flo Scans • 1000 watt Hart inverter with 4 6D main batteries • Bennett Trim Tabs • 2 Raymarine C-series GPS chart plotters with depth sounders and 24 mile radar connected via Seatalk. Auto Pilot, data logger and VHS • Engine Room Halon fire suppression system with remote alarm and activator, Sea Key GPS system and a complete systems alarm at the bridge • Electric anchor winch with remote, 300’ chain and Delta anchor. Additional 300’ rigged anchor • Sony and Bose stereos, DVD player with 2 TV’s • Glo Mar TV antenna • Sealand Vacu-Flush head • Separate shower • Caribe 9X rigid inflatable, Honda 15HP 4-stroke with electric-start, SS bow chocks and 600LB electric davit • 2-Zone reverse-cycle AC • Swim step with built-in ladder, HC cockpit shower, UW lights, built-in fish locker with macerator and wash-down system • Maxum outriggers with down-pole, Rocket Lunchers and 4 flush rod holders • 100 gals fresh water, 40 gal holding tank with macerator Priced at 230,000 including a slip in Port Royal Marina in Redondo Beach, CA. Use of my Catalina mooring Isthmus K5 in Two Harbors is negotiable.